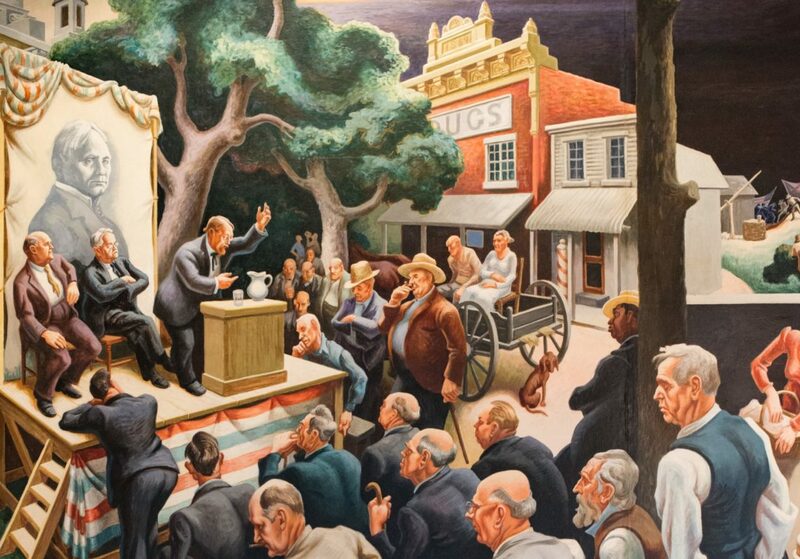 The crowd at the political speech in Thomas Hart Benton’s mural A Social History of the State of Missouri. 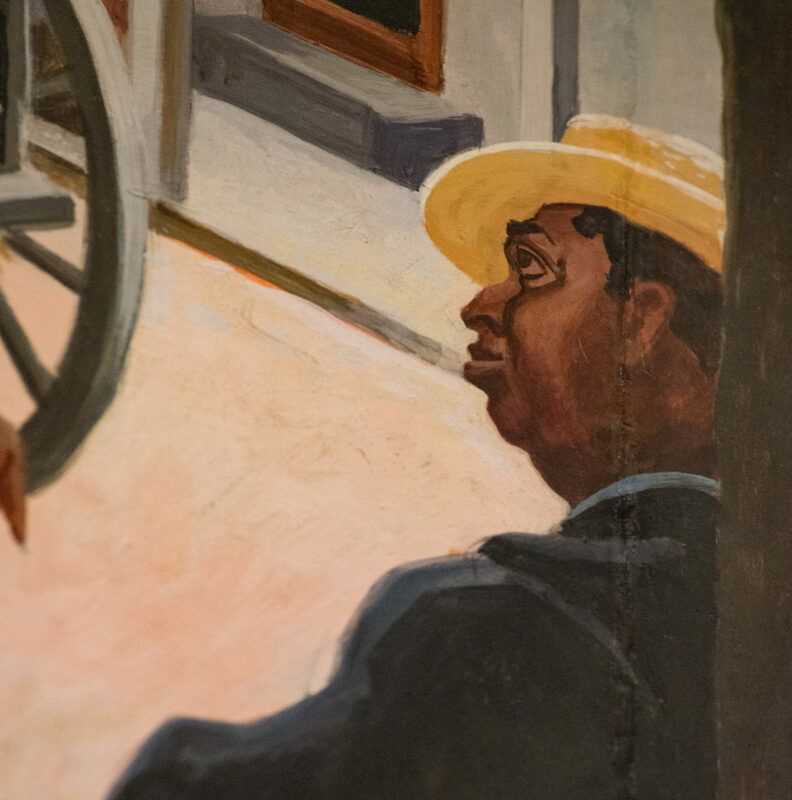 Art historian Dr. James Bogan believes he’s solved a mystery – the identity of a pivotal African American figure in Thomas Hart Benton’s 1936 mural in the Missouri State Capitol. Dr. James Bogan believes the figure is based on Jordan Chambers, a politically powerful man in St. Louis at the time. Benton’s A Social History of the State of Missouri adorns the walls of the Missouri House of Representatives Lounge in Jefferson City. One man, leaning on a tree and listening to a political speech, was the subject of an important story in Benton’s memoir on the mural’s creation, but he has remained anonymous until now. Benton’s memoir tells a story of former Missouri Gov. Guy Park calling the artist into his office and telling him that a St. Louis politician he called the “most important black voter ‘getouter’ in the town” objected to Benton’s portrayal of black people, especially the graphic images depicting slavery. Benton did not want to erase that piece of Missouri history from the painting. Instead, he showed the politician the mural and explained how he would show the progress of black people in Missouri, overcoming misfortune and rising to political importance. Benton invited him to be the model for a figure, leaning on a tree at a distance. Benton says the man agreed, and the rest of the mural remained unchanged. Bogan spent the last couple of years combing through historical photos and archives to solve the mystery of the man’s identity. An inquiry to the St. Louis Post-Dispatch yielded an obituary of Jordan Chambers, who fit the profile of Benton’s description of the man. The man was arguably as politically important as Kansas City political boss Tom Pendergast. Priddy says the inclusion of this African American figure showed the advances that black people had made in the state up until the 1930s. The image is also one of the few African Americans portrayed in any art in the Missouri Capitol in that era. Benton experts say such illustrations of larger social issues are part of the endurance of his work. Adams hopes more photos of Chambers will emerge showing him at the same angle as portrayed in the painting, but both Priddy and Adams believe the circumstantial evidence around Bogan’s discovery is strong. In the meantime, Bogan’s research could help a new generation of Missourians better understand their past.